Promoter The Promoter is Nestlé Australia Ltd (ABN 77 000 011 316) of 1 Homebush Bay Drive, Rhodes NSW 2138. Promotional Period The Promotion starts at 12:00am AEDT 8 February 2018 and closes at 11:59pm AEDT on 12 February 2018. Entry Restrictions Entry is open to residents of Australia who are aged 18 years and over. 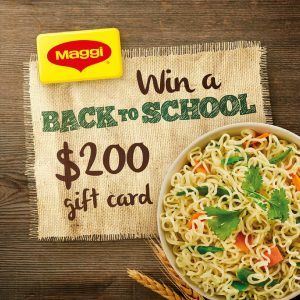 (ii) Post a photo in the comments of The Promotion Facebook post showing how your family eats MAGGI 2 Minute Noodles for an after school snack. (iii) The Promoter will judge all entries to determine winners. Multiple unique entries are permitted, however entrants can only win one (1) prize. Judging Details The 4 most creative, original and suitable entries will be awarded with a prize. All decisions are at the discretion of the Promoter and no correspondence will be entered into. Judging will take place 15 February 2018 at 9am AEDT. Major Prize 4 The Major Prize will consist of 1 $200 eftpos gift voucher. Conditions of prize As per conditions of entry. Prizes are not transferable & cannot be converted to cash. Prize Winner Notification Major Prize Winners will be notified by either telephone or email by 23 February 2018 AEDT. Prize Winner Publication Details The first name and suburb of winners will be published on www.nestle.com.au/productnews/winners on 23 February 2018 at 5pm. Prize Claim Date All prizes must be claimed by 30 March 2018 at 5pm AEDT. If the prize is not claimed by the Prize Claim Date, the prize will be forfeited and the Promoter may determine an alternative winner. These Conditions of Entry are to be read in conjunction with the Schedule to Conditions of Entry. To the extent that there is any inconsistency between the Conditions of Entry and the Schedule to Conditions of Entry, the Schedule to Condition of Entry prevails. Information on how to enter & prizes form part of these terms & conditions. Any entry not complying with these Conditions of Entry and Schedule to Conditions of Entry is invalid. Entry by SMS: Should the Promotion require an SMS entry, the cost of sending a text entry is the responsibility of the entrant and will vary depending on the mobile network used. Total cost of text entry made within Australia will not exceed 60 cents including GST, whether sent during the Promotional Period or not. Entrants may need to consult their mobile phone provider prior to entering the Promotion. Receipt of entries for electronic entries: Entries are deemed to be received at the time of receipt into the Promoter’s database. The Promoter is not responsible for incorrect, inaccurate, incomplete, late, lost or misdirected information caused by an entrant or occurring during transmission. Games of skill: All decisions are at the discretion of the Promoter and no correspondence will be entered into in this regard. Verification Requirements: The Promoter may require the entrant to provide proof of identity, age, and residency. Where the Promotion requires the purchase of a product(s), the Promoter reserves the absolute discretion to require any prize winner to produce the original purchase receipt/s for every entry they or their household made during the Promotion period in order to claim a prize. If an entry cannot be verified to the Promoter’s satisfaction, the entry will be invalid. Monetary Prizes: If money is offered as a prize, the prize may be awarded in a cheque form or by eftpos transfer to a nominated bank account. 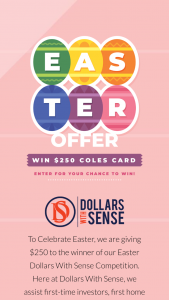 If the prize is to be delivered by eftpos, the winner will be required to advise the Promoter of their nominated bank account details for their prize money to be deposited. Eftpos transfers may take up to 30 days to process. Tickets to an Event or an Experience: If tickets to an event or an experience are offered as a prize, the prize will be subject to the organiser’s terms. The Promoter is not liable for any cancellation or re-scheduling that may prevent prize fulfilment. The tickets to the event cannot be converted to cash nor replaced if lost, stolen or defaced. Tickets can only be used on the date(s) specified on the ticket. Trip Prize: If travel is offered as a prize, flights and accommodation are subject to availability at time of booking. Additional spending money, meals, taxes, valid passports, visas, transport to & from departure point additional transfers, insurance & all other ancillary costs not specifically stated in the Schedule to Conditions of Entry are the responsibility of the winner. It is a condition of accepting the prize that all components of the prize be taken during the trip and all persons taking the trip depart from & return to the winner’s nearest capital city at the same time unless otherwise agreed by the Promoter & that all persons taking the trip sign a waiver of liability & an indemnity in the form determined by the Promoter in its absolute discretion. Vehicle: If a vehicle is offered as a prize, the vehicle includes registration, 3rd party insurance, a full tank of petrol and all on-road costs. Any additional costs including comprehensive insurance and additional optional extras are the responsibility of the winner. Standard Prize Restriction: All prizes unless stated to the contrary are not transferable & cannot be converted to cash. Prize Value: Prize value is correct at time of printing but no responsibility is accepted for any variation in the value of any prize. Prize Delivery: Prizes will only be delivered in Australia and each winner should allow 28 days from prize winner determination for delivery of their prize, or (if required) the date they advise the Promoter of their nominated Australian bank account details for their prize money to be deposited. If a prize winner or participant is under the age of 18 years of age: The prize will be awarded to the winner’s parent/guardian on their behalf. The Promoter may require a winner under the age of 18 years to be accompanied by their parent or legal guardian throughout prize fulfilment. If the prize becomes unavailable: The Promoter may substitute a different prize item of equal or greater value in the event that any prize item is unavailable despite the Promoter’s reasonable endeavours to procure within Australia. This substitution may be subject to any approval process required by any relevant gaming or lotteries authority if the Promotion is a game of chance. Australian Consumer Law: The winner should look to the manufacturer of products and provider of services awarded as prizes for all warranties. These terms and conditions do not exclude or limit the application of any statutory provision (including a provision of the Competition and Consumer Act 2010) where to do so would contravene that statute or cause any part of these terms and conditions to be void. Tampering: The Promoter reserves the right to disqualify any individual entrant or group of entrants for tampering with the entry process. Tampering includes but is not limited to the utilisation of techniques designed to avoid payment of call costs or the making of multiple entries that are not associated with a separate eligible purchase, or submitting an entry which is not otherwise in accordance with these Conditions of Entry and Schedule to Conditions of Entry. Should the Promoter find evidence of tampering by an individual, in addition to declaring any or all entries made by that individual invalid, the Promoter may also preclude that entrant from participation future promotions of the Promoter. Risks: The entrant acknowledges that participation in the Promotion and prize fulfilment may involve risk. The Promoter may require a winner (and their companions) to sign an indemnity and release prior to participation in the prize fulfilment or participation in the Promotion. Publicity: Winners may be required to participate in a follow-up interviews and publicity. By entering the Promotion and claiming a prize, the winner agrees that the Promoter may use their name, image and photograph/s for publicity and Promotion purposes, without compensation, and agrees that the Promoter will own copyright in any such images and photograph/s and in all material incorporating the photograph/s. Tax: Winners should obtain their own independent financial advice in relation to any tax liability that may arise as a result of their participation in the Promotion. Promoters Decisions: All decisions of the Promoter are at their complete discretions and are final. No correspondence will be entered into. Social Media: The Promotion is in no way sponsored, endorsed or administered by or associated with Facebook, Instagram or Twitter. Entrants completely release Facebook, Instagram or Twitter from any and all liability relating to the Promotion.